This book is copyrighted by MediaMarx, Inc. Resale and reproduction is any shape or form is prohibited without MediaMarx's permission. All rights reserved. PassPorter is one of the leading publishers of printed Disney guidebooks. 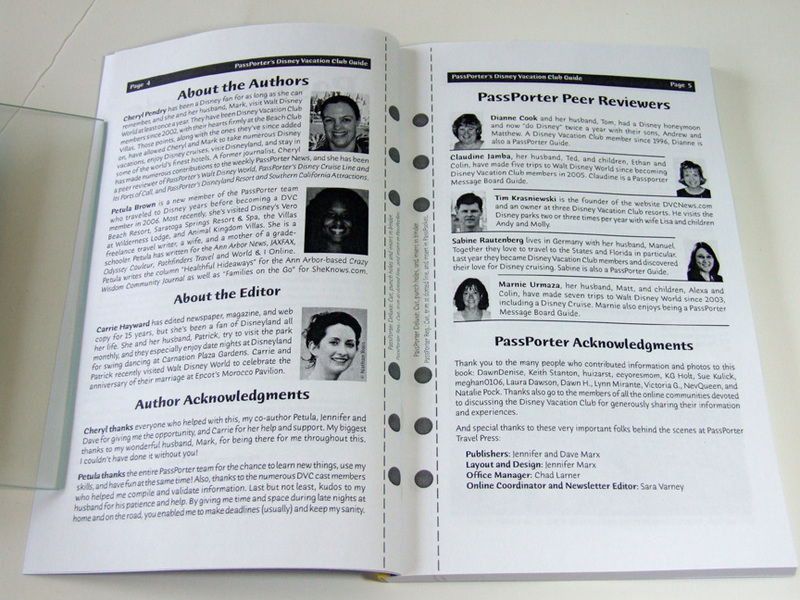 PassPorter's print books are found on bookshelves around the world and have garnered 12 national book awards. We have a loyal, devoted following, a very strong community of Disney fans, and a genuine love of Disney. If you already have a copy of PassPorter's Walt Disney World, this e-book is filled with entirely new information. We think of it as the information we would like to include in our printed guidebooks if we had the room. Learn all about the extremely popular Disney Vacation Club program at Walt Disney World, Disneyland, and around the world! Now in print or e-book format! PassPorter's Disney Vacation Club Guide is a 184-page in-depth guide to all aspects of the Disney Vacation Club, from deciding whether to join to deciding where and when to use your points. Included are beautiful color photos and tips on maximizing your experience with the Disney Vacation Club (DVC). If you've ever wondered what the club is all about or wanted to learn more, PassPorter's Disney Vacation Club Guide is the perfect introduction. This book will answer the most commonly asked questions to help you decide whether the Disney Vacation Club is the right investment for you. The e-book also explores the club's points system -- including how to buy, bank, and borrow points--show you how to choose a home resort, and discuss membership dues. Many PassPorter readers contributed their photos so we could include them in the e-book. For those who are already members, this guide brings together everything you need in one place, including a look at all the ways you can spend your points and the various benefits available to you. Don't forget that Disney Vacation Club members can use their points to visit other destinations around the world, including Disney parks and cruises, along with top hotels in a range of cities. You can even take an Adventures by Disney package tour. PassPorter's Disney Vacation Club Guide will help you manage your points, explore other club destinations, and explain the ins and outs of ownership. All of the Disney Vacation Club resorts have different themes and amenities. While the majority are located at Walt Disney World in Florida, two offer the opportunity for beach getaways at Vero Beach in Florida and Hilton Head Island in South Carolina. PassPorter's Disney Vacation Club Guide offers an in-depth look at these resorts, which are not usually covered in Disney guidebooks. We'll also take a peek at two new properties Disney has in the works, one in California and one in Hawaii. Important Note: This book is NOT a general travel guide that covers all the ins and outs of planning a Disney vacation. Instead, this book focuses on enhancing the information and tools in our general guidebook, which we assume you will have (or don't need) if you use this file. Click here to purchase your electronic edition (e-book) for only $8.95, or your print edition (paperback) for only $16.96! Or get the e-book edition free-of-extra charges as a passholder in the PassPorter's Club -- click for details. 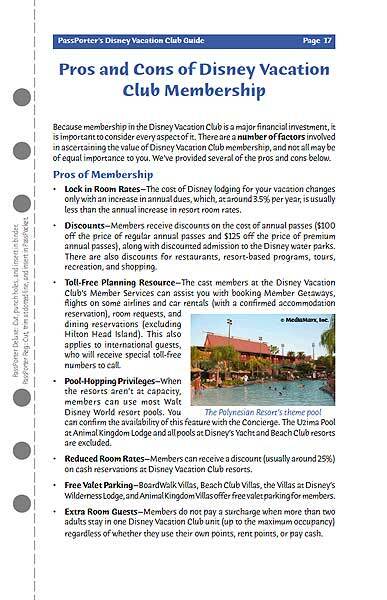 About the E-Book: PassPorter's Disney Vacation Club Guide is 212 pages and 5.5 MB, updated in March 2016. And like all our e-books, this file is fully-formatted just like a regular print book ... . it will even fit into a Deluxe PassPorter Binder, if you have one. Photos in the e-book are in full color. About the Print Book: PassPorter's Disney Vacation Club Guide is 212 pages, perfect-bound, and printed in black-and-white. This book was printed using a "digital short print run" technology, and its print quality is not the same as traditional offset printing. The two biggest differences are photographs (they are grainier and sometimes hard to make out) and price (short print runs are much more expensive). Please keep these points in mind when purchasing this print edition. We believe these factors are a small drawback when compared to the huge benefit of having a printed, bound book to read and carry with you. BONUS: Owners of this book receive a valuable 30% off discount coupon for any of PassPorter's print guidebooks! The coupon is located near the end of the e-book. Potential Readers: If you are unsure if this book can help you, please feel free to contact us for advice. If we don't think this book is for you, we'll tell you. If you already have one of our printed PassPorter's Walt Disney World guidebook, you'll probably love this book! Questions: If you have questions about this book, please contact us prior to purchase and we'd be happy to assist you. Payment Type: We accept credit cards and PayPal through our online store. Payment is due upon purchase. Shipment: The e-book edition has no shipping or handling fees -- it is available as an electronic file (Adobe PDF) only. You will be able to download your file to your computer IMMEDIATELY -- no shipping delays. Instructions on how to print the e-book are provided at the end of the e-book's text. Normal shipping and handling charges to the print edition. Terms: Satisfaction is guaranteed! If you are unhappy with this book, we will issue a refund. If you are unsure about purchasing this book, please be assured that PassPorter is trustworthy. We have been selling our guidebooks online and in bookstores since 1999 -- we have more than one million happy readers! Ask about us on Disney message boards!